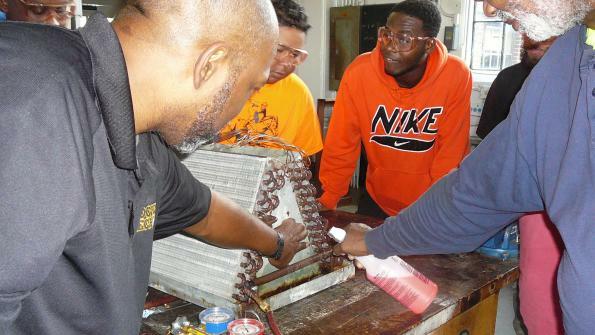 Where can governments recruit the next generation of HVACR technicians? What are some resources that can help boost government workforces of HVACR technicians and other personnel? Labor forecasters are projecting that state and local agencies will need to boost their staffs of HVACR mechanics and installers by 3 percent between 2015 and 2020. Economic Modeling Specialists International (EMSI), a CareerBuilder company (EMSI), calculates that 12.4 percent of the total heating/ventilating/air conditioning/refrigeration (HVACR) workforce, or about 39,326 workers, are nearing retirement age (ages 55-64). Among governments, EMSI is projecting that state and local agencies will need to boost their staffs of HVACR mechanics and installers by 3 percent between 2015 and 2020 due to retirements and expanding government facilities. By 2020, federal, state and local governments will employ 20,384 HVACR personnel, predicts EMSI. GPN has written about HVACR workforce trends in government here. EMSI is a Moscow, Idaho-based labor market data research firm that uses data from all state labor departments in its calculations. There are some federal government resources that can help boost government workforces of HVACR technicians and other personnel, says Jessica Wicks, marketing coordinator at DUCTZ International. The company is a service franchise system that performs duct cleaning and HVAC system repair. Wicks (photo at right) tells GPN that the yearly federal grants that help women through the Women in Apprenticeship and Nontraditional Occupations program are important. The apprenticeship programs, says Wicks, are designed to recruit, train and retain women in high-skill occupations in a variety of industries, including transportation, energy, construction, and information technology. “Creating opportunities for women to gain the training and experience needed to compete for skilled jobs is vital to our industry’s and our nation’s future,” Wicks told GPN. Women are 50 percent of the population, yet occupy less than 1 percent of the HVACR industry, says Renee Cardarelle, executive director of the Nexstar Legacy Foundation. The foundation is dedicated to attracting individuals to the heating, air-conditioning, plumbing and electrical industries. The organization serves as a resource for information on careers and training, as well as a source of financial aid. Cardarelle adds that one option for governments facing an HVACR skills/worker shortage is to build their own technician workforce. She tells GPN that government recruiters can get more information on what it takes to on-board and train inexperienced technicians at this site. Look for experience and ask for references when recruiting HVACR personnel, urges Barry Franklin, chief editor/owner at HvacClasses.org and Sechel Ventures, Inc.
Franklin says recruiters need to evaluate the HVACR certifications that job candidates may hold. Some of the HVAC certifications include those offered through North American Technician Excellence (NATE), HVAC Excellence, and the Refrigeration Service Engineers Society (RSES). His organization has a certification resource that has information.